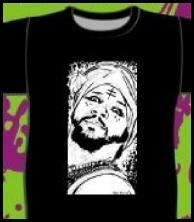 Enjoy your favourite male bellydancer on a comfy black T-shirt with a design drawn by artist Mike Rooth. Click here to get yours. Workshop notes from the August 2018 ATS® costuming workshop held by Valizan and Monika Wolf. Click on photo to view PDF of notes.